Ask just about anyone what their fitness goals are and you’ll probably hear something about wanting six-pack abs. Everyone wants a flat, toned stomach, but few people actually have one. It takes a lot of discipline and the right combination of exercises to achieve a midsection like the ones you see in fitness magazines. You also have to make sure you’re not accidentally sabotaging your progress. If you’re desperate for six-pack abs and aren’t seeing results, take a step back and make sure you’re not making one (or more) of these four common core training mistakes. When you think of exercises that will help you attain the elusive six-pack, one of the first ones that come to mind is probably the infamous crunch. Crunches have been demonized in the past, but new research from the American Council on Exercise actually shows that they activate more muscles than many other popular abdominal exercises. The crunch can definitely be included in an effective core training routine — just make sure you’re doing them properly. Move deliberately and focus on form. Don’t just move as fast as you can to get through the exercise. Most people also have a habit of training their core at the end of their workout. Some people do this because they’re worried about fatiguing their core early on and not being able to support their spine effectively during more challenging exercises. The good news is that you don’t have to totally fatigue your abs to get a good core training session in. And, doing a couple of core training exercises at the beginning of your workout can actually help you prepare your core and “wake it up” so that you can use it more effectively during those challenging exercises. Try adding in planks, bird-dogs, or some crunches to your warm-up and see if it helps you brace your core better when you squat or deadlift. There’s a lot of equipment out there that’s meant to help you train your core. The bad news, though, is that a lot of it isn’t very effective. Basically, steer clear of machines that are designed to work your abs. They could cause you to injure your back, and they’re rarely going to be as effective as using your own bodyweight. There are some pieces of equipment that do help you challenge your balance and engage your core better. 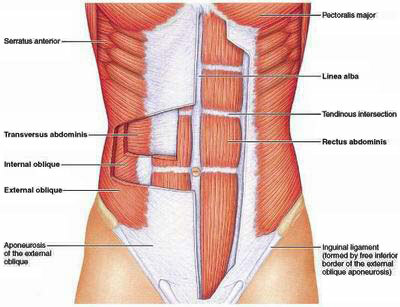 Your core is just like any other muscle group in the body. When you do the exact same exercises in the exact same way, they’re going to adapt and stop getting stronger. If you want to have defined, six-pack abs, you need to switch things up every few weeks to keep seeing results. There are lots of things you can do to add variety to your core routine. In addition to adding in new exercises (if you’ve been doing lots of crunches, do some planks or ab rollouts instead), you can also play with the number of reps and sets you do. You can also increase the duration of the exercise when doing isometric holds, or you can increase the load by using a thicker resistance band when doing exercises like Pallof Presses.